This entry was posted on April 28, 2011 by Lady Emma, in London and tagged dog, duchess, duke, elizabeth, ghost, ham, haunted, house, path, richmond, river, thames, walk. Bookmark the permalink. “Vivat Rex” was the welcome message to us. Long live the King. This is carved into the wood of The Great Hall at Ham House as a reminder that its inhabitants were ardent Royalists and fully supported the monarchy. It was this devotion that allowed William Murray to receive patronage from King Charles I and furnish his home with the best fine art, textiles and furniture of the time (not bad since Murray used to be the king’s whipping boy). But his daughter Elizabeth was the real go-getter. She saved the house from Oliver Cromwell and his Roundheads and continued to add to its opulence and invited important people of the time to enjoy it with her, making sure it was fit for a king (special rooms were designed for a visit from King Charles II and his new queen during the Restoration), up to her death in 1698. The remarkable thing about this house along the Thames near Richmond is that it is a virtual time warp from the 17th century: almost nothing has changed since then – the silk wall hangings, the tiled floors, the paintings on the ceilings, the private closet where Elizabeth, Countess of Dysart and Duchess of Lauderdale, took her tea with friends (below a painting of Medea, the woman in Greek mythology who enacted revenge on her husband for bringing home another woman by killing her with a poisoned dress, then killing her own children. Weird.) And it contains one of the first bathrooms to be built in England (Elizabeth was ever the slave to fashion. Bathing became “trendy” during her time.) But the most scintillating fact about the house it is that is reputed to be haunted. By Elizabeth. And her dog. Steve and I decided to take a break from London and take a train to Kingston with the intention of walking from Kingston to Ham House, a distance of about 4.5 miles. Kingston is technically still part of London (god it’s a big city) but within its own borough, Kingston-upon-Thames. Apart from bleak area surrounding the train station (TGI Friday’s? I hear it is always Friday in there but after two weeks of freedom I was happy with a plain ol’ Tuesday) the scenery was bucolic and the air fresh to the nose. The Thames is much narrower and the houses along it much larger there than in the central part of London. Each house appeared to have its own dock in the water attached to which was a boat, either a canal boat or some sort of cruising vessel that looked as though it could hold at least four small families and their pets. The walk along to Ham House was lovely, a wild arrangement of knolls and groves with breaks in between to view the river and the many waterfowl swimming upon it. 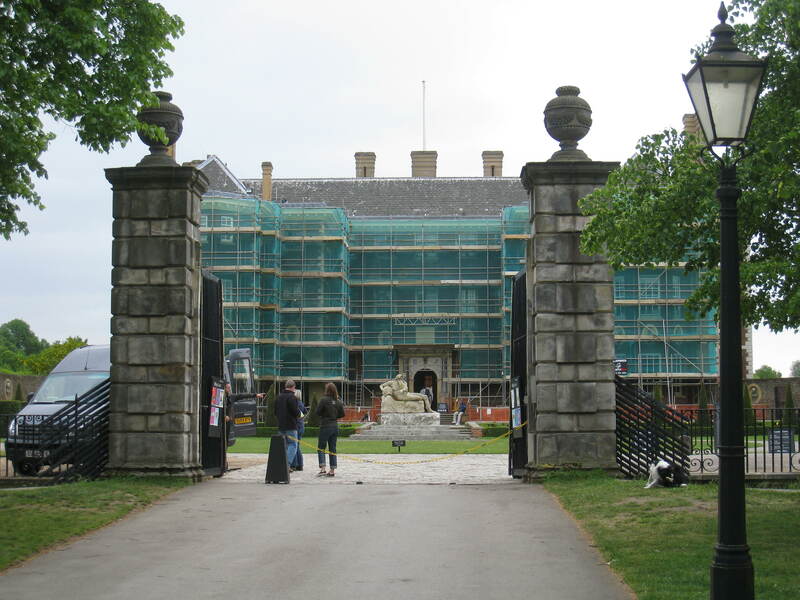 It was quite a sight to come upon the house this way, although soon disappointing as we encountered full scaffolding (they are doing some repair work to the façade – see photo above.) The image would have been even more spectacular without it. 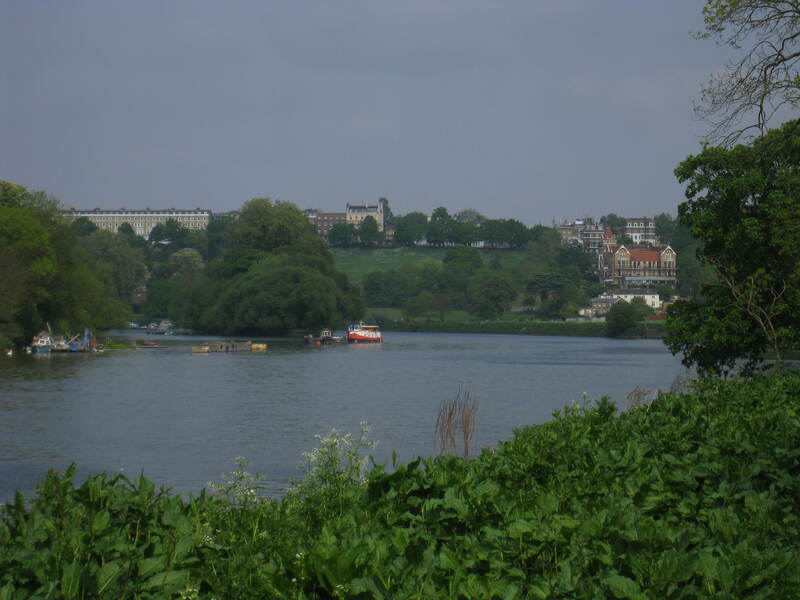 The Thames Path, as the walk is called, runs for 184 miles which is almost the length of the entire river. It was great that we could do this one bit and save the rest for another time. Below are some photos from the walk and the house. No sightings of Elizabeth or her dog, unfortunately. (Some bratty young children were nearly turned into ghosts, mind you.) However, the feature photo above is a great portrait of her with her second husband, John Maitland, the Duke of Lauderdale. I love the expression on her face, the way she flirtingly twirls her hair and is not ashamed to show her cleavage – she owns it! The Great Staircase. Note the fruit basket. Emma walking up Richmond Hill. Note the twist in the Thames in the background.